What do you get the modern soon-to-be-wed couple that seem to have everything? A pizza oven … of course. Pizza has been a popular fast food around the globe for years. Thin crust, thick crust, stuffed crust? Cheesy, meaty, vegetable, chocolatey… too far?! Having your very own pizza oven is all the rage at the moment – even top celebrity chefs use them. 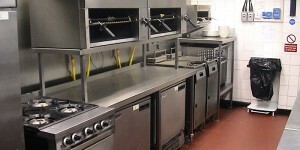 But do you need to have one as part of your commercial kitchen? There’s nothing tastier and more comforting than a hot slice of your favourite pizza (we’re quite partial to eggs Florentine with olives), but it just doesn’t taste the same when cooked in a conventional oven at home. Does it? Pizza ovens can be very economical to run and only a small space is required. If powered the traditional way burning wood or coal, this really does add to the flavour of the finished dough. Pizza is quick, cheap and tasty, so it would be a great addition to your commercial kitchen. You’d also be able to bake up other delicious delights such as garlic bread, pasta dishes and even hot desserts in this simple and stylish, multi-purpose cooker. Did you know, according to Guinness World Records, the most expensive pizza on sale in the world at the time of writing this article is $2700 (approx. £2100)? It’s sold at the Industry Kitchen in New York. The pizza base is made up of black squid ink dough, topped with white Stilton cheese, truffles, foie gras, Ossetra caviar and a sprinkle of 24K gold leaves to finish it off. There’s no limit to what you could achieve with toppings, dishes and price tag (it seems) with a new pizza oven to shout about. Not only are they easy to use and easy to clean, pizza ovens don’t have to cost the earth. The profit margin with pizza is enormous so it makes sense to need the dough. Contact us to discuss our range of pizza ovens today on 01384 459111 and start adding to your bottom line with delicious oven baked pizza.